Access Scientific, LLC announced completion of an in vivo study demonstrating the superior anti-thrombotic (i.e., anti-clotting) property of its unique intravascular catheter material, ChronoFlex C® with BioGUARD™ technology. As hospitals continue to face the pressures of Value-Based Purchasing, novel products like POWERWAND offer solutions that both improve patient outcomes and reduce overall costs. Access Scientific said that in the coming months it will reveal results of another completed study (pending publication). Combined with the current announcement of superior anti-thrombogenicity, this next study demonstrates the value of ChronoFlex C with BioGUARD as the ideal material for a wide variety of indwelling vascular catheters. Access Scientific, LLC, based in San Diego, Calif., is an evidence-based, infection prevention company offering innovative vascular access devices designed to reduce the need for and risk of vascular device-related complications, including bloodstream infections. More on the vascular access device market in the U.S. can be found in a series of reports published by iData Research, entitled the U.S. Market Report Suite for Vascular Access Devices and Accessories 2018. 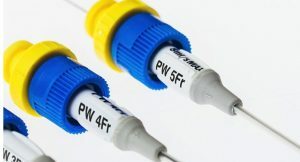 The U.S. market for vascular access devices and accessories includes implantable ports, port needles, central venous catheters (CVCs), peripherally inserted central catheters (PICCs), peripheral intravenous catheters (PIVCs), midlines, dialysis catheters, ultrasound systems, tip guidance devices, catheter securement devices, syringes and needles. The iData report series on vascular access devices covers the U.S., Brazil, South Korea, Japan, Australia, China, India and 15 countries in Europe including Germany, France, the United Kingdom (U.K.), Italy, Spain, Benelux (Belgium, Netherlands and Luxembourg), Scandinavia (Finland, Denmark, Sweden and Norway), Portugal, Austria and Switzerland. Reports provide a comprehensive analysis including units sold, market value, forecasts, as well as detailed competitive market shares and analysis of major players’ success strategies in each market and segment. To find out more about vascular access device market data, register online or email us at [email protected] for a U.S. Market Report Suite for Vascular Access Devices and Accessories 2018 brochure and synopsis.